A day for celebrating and welcoming the older people of Liverpool, open to all. It’s free, and there will be theatre and live poetry, including Jackie Kay (Scottish poet laureate, or Makar). This is a drop-in event that will be going on all day – feel free to join us at any point! The day will begin with tea and coffee, followed by a workshop demonstration on how to use creativity and the arts when caring for someone living with dementia. 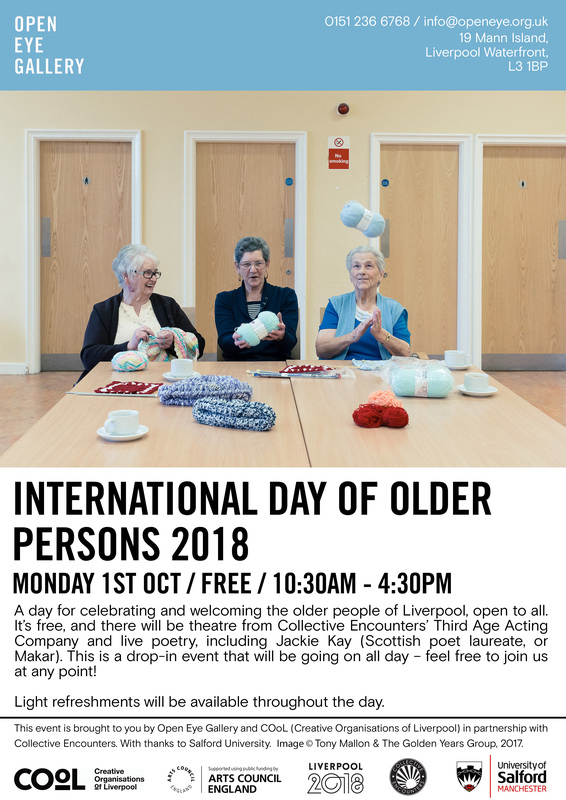 There will then be poetry readings from Pauline Rowe (Open Eye Gallery’s writer-in-residence), a panel discussion with professionals working with older people, and short plays throughout the afternoon from Collective Encounters’ Third Age Acting Company. At 16:00, we will have a special poetry reading from poet and novelist and Jackie Kay MBE FRSE, winner of the Guardian Fiction Prize and Somerset Maugham Award.